Enhanced analog modeling synthesizer with powerful front panel features. 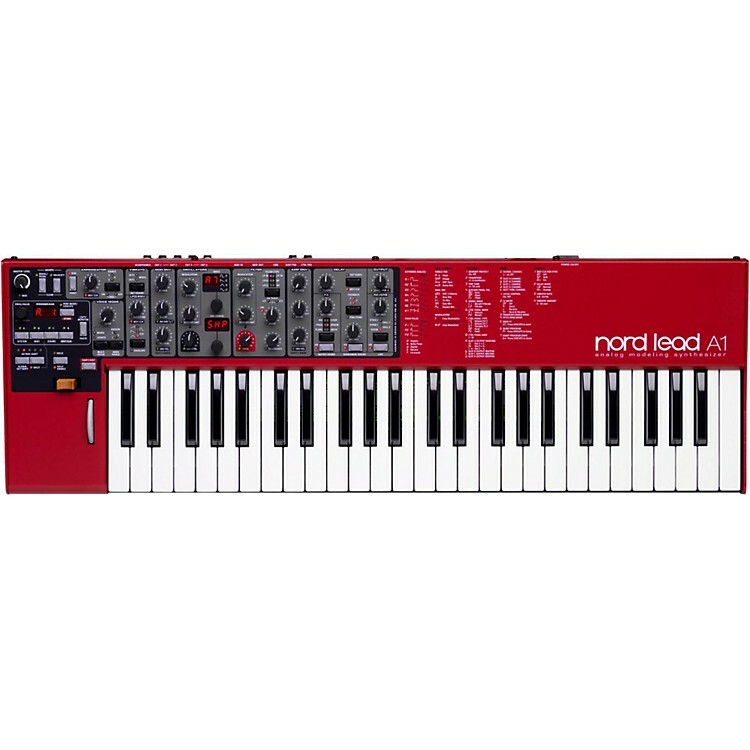 At the heart of the Lead A1 is Nord's analog modeling engine. Taking virtual analog synthesis to the next level, this modeling recreates a total analog signal path with uncanny realism, and is capable of immense sonic variety. With 24-voice polyphony and four simultaneous synthesizer parts, the Lead A1 is a true synthesizer powerhouse that goes far beyond the current trend for limited capability analog reissues. Fundamental to the design of the Lead A1 is a simple yet sophisticated front panel interface. The design is in fact the result of requests from professional players - even the most experienced programmers - who need to create the perfect sound as quickly as possible for today's live or studio time demands. The Lead A1 allows easy patch creation and experimentation thanks to a new and unique oscillator section, pre-programmed modulation matrix, and simplified ADR envelopes. Dive in and create incredible patches far quicker than would normally be possible with a synthesizer of such power. The keyboard version features a Fatar 49-key keybed with a super-fast response. Aside from the keys, mod wheel and pitch stick, the rack/desktop version features a 100% identical feature set, in a design suitable for stage or studio. Fixed a bug in the Delay clear function. Modulating Osc Ctrl in mode "Snc" could cause audio pops. Fixed. Update pitch bend when adjusting range. Improved BP filter at high frequencies. Fixed bug where the name from the last loaded performance was given to a performance made from patch buffers using a mode switch by pressing Copy + Performance, then storing. Pulse sub waveform mixed with formant wavetables did not behave as expected. Fixed. Filters LP M and LP TB could produce strange sounds at frequency set to zero and playing at very low pitch. Fixed. Stand-out sounds for live or for the studio. Spice up your sound with A1 today!